Today I ventured into New York City to firstly go to Steinway Hall and then go to the famous street affectionately known as piano row. Steinway Hall is in West 57th Street just down the road from Carnegie Hall and piano row is in West 58th Street. I have finally got my bearings for this incredible city and I ventured out without my maps for the city and subway. First stop was the home of Steinway, known as Steinway Hall. To walk into the main room with the painted ceilings and dimmed lights, it reminded me of the two great cathedrals I have already visited. In the middle of the room was a Model D just asking to be played. I walked down the corridor and tried out a factory rebuild Model A as well as a new Model A. A week in New York has changed my perception of tone quality. I like these pianos, and to those who know me well must think that I have gone crazy. Both pianos were capable of producing a soft clear sound and I wanted to keep playing. In the room next door were Models S,M and O and they too were prepared beautifully. I returned to the main room and asked if I could play the D. I thought that a quick chromatic scale would be all that I would play and I would leave for the next piano shop. I could not remove myself from this instrument. I played my repertoire of four bars of a few pieces, and then just started to experiment with different combinations of notes and expressions. This piano told me it wanted to perform concertos in a very large hall. I wanted to hear Rachmaninoff and Brahms performed on this monster. Why don’t we see New York Steinways as an alternative concert instrument in Australia? I first heard the name of this piano shop from the movie “Music and Lyrics”. I met the company President, Sara Faust, who comes from a background of a performing pianist, and is passionate about pianos and the music they produce. Sara introduced me to all the pianos in the showroom and also informed me they have a large rebuilding facility in White Plains, NY. First piano was the Yamaha CFX concert grand which I have heard so many good reports about. Sara demonstrated its abilities, and I was impressed with its qualities. 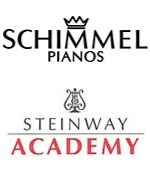 More pianos, including a Bechstein concert grand, new Yamaha C6X, C3X and rebuilt Steinways were demonstrated. The company has a large rebuilding facility where a large number of pianos are rebuilt. The factory designs new soundboards and bridges from high quality stock and with no compromise in standards. This company takes great pride in their work for both performance and aesthetics. Selection of action parts to achieve the correct action designs and the touch of the instrument. Different voicing, or tone regulation is offered for the location of the instrument, for example a warmer voicing for the home, to a more powerful and brighter sound for concert instruments. Regulation of the action is also customised for the end use with concert instruments being slightly lighter, faster and super responsive. I asked Sara what type of instrument the performers require. The answer is much the same as all others I have spoken to. It must be super responsive, capable of expressing all musical ideas with ease and control. A huge dynamic range but capable of producing the softest sounds with no surprises in touch or sound. The pianist wants to play, not work. This company is the Fazioli representative and this mighty instrument was in their recital hall with pianists rehearsing the Lutoslawski Variations. I didn’t get a close up however the music shined with this beautiful Italian. Rebuilt Steinways including two rare case designs were in the showroom. Bosendorfer, Bluthner, Steingraeber, Estonia and Kawai. I knew the Bosendorfer grands, however the 225 cm had the most beautiful bass and reminded me that the Vienese grands were a high quality instrument. I have never seen a Steingraeber and they offered a large upright of 138cm to play. This was an incredible instrument, and I wonder what the grands are like. I discovered the Sauter grand from Germany. It reminded me of the Schimmel grands with their beautiful soundboards and the Renner parts. A quality piano. Thanks for reading my blogs. Appreciated! Difference between US & Hamburg…. where do I start? same case, same soundboard, same (now) keyframe & keys, different balance rail, different damper assembly, different hammers, different voicing techniques, different bridge pins, um there is more. Imagine they are twins but different personalities. Comes down to which one do you prefer? I have a feeling the US technicians are not very familiar with voicing techniques on the Hamburg. Cliburn Hamburg had a nice tone in mezzo forte but suddenly harsh at forte and fortissimo.